At the heart of Andersons of Inverurie is our wonderful coffee shop. Located upstairs, this is where you’ll find our team brewing tasty beverages, and serving up delicious snacks, sandwiches and more. It’s the perfect pit-stop during a busy day of shopping, and is a popular spot for meeting family and friends for breakfast, lunch or a cup of coffee. With its warm and welcoming atmosphere, array of freshly prepared food, and team of friendly staff, it’s no wonder people visit us every day of the week. 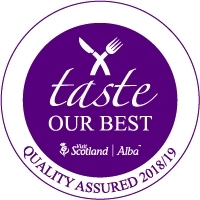 We always try to work with the best, local products - from our fresh fruit and vegetables from Turriff's of Montrose to our bread, rolls and oatcakes from J. G. Ross around the corner. Our menu is diverse, but our signature dish at lunch is definitely our soup and a sandwich. Our homemade scones and traybakes are also a hit with the regulars! We have daily specials, and everything is prepared from scratch. You can find the big chalk board menu on your right as you come in - but with so many tasty dishes on offer, it can be a hard choice! Coffee is our passion, and that’s why we only use the best beans. Our coffee beans come from South America (this is where Carmen, who runs the coffee shop, is originally from), and we grind the beans ourselves. Whether your go-to is a latte or a cappuccino, a flat white or an americano, your coffee will be made with precision and skill every single time. The ambience and atmosphere, combined with quality food and drinks, is what attracts people back to our coffee shop time and time again. It’s an enjoyable and relaxing experience. Our team serve quickly and efficiently, so you can enjoy your time with your colleagues, friends or family. And we pride ourselves in keeping the coffee shop incredibly clean at all times, so you’re comfortable and at ease.